At the American Physical Society in Boston, IBM will be announcing further progress in creating a practical, working quantum processor. 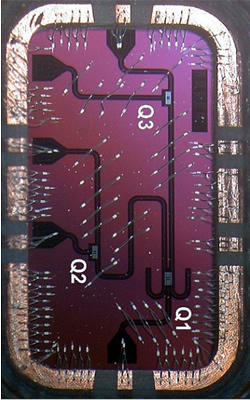 Big Blue said it has managed to increase the longevity of information provided by quantum bits, a crucial hurdle that must be crossed in order to make quantum computing useful, practical and scalable. Don't be too thrilled though -- we still have a long way to go. IBM's latest achievement centers around manipulating qubits themselves in nearly heatless superconductors frozen a tenth of degree away from absolute zero. Qubits are the various states in which quantum particles can exist, be they off, on or both off and on simultaneously. Off and on simultaneously? Yep, that's right. Quantum physics is a strange world where particles can exist in multiple places, instantaneously influence other particles billions of light years away, become waves or matter and even pop in or out of existence at the drop of a hat. Some quantum processes like entanglement are truly stranger than fiction. Soon, IBM hopes to have 5 to 10 qubits working in tandem. According to physicists, a paltry 30-qubit quantum computer could potentially equal about 10 teraflops of processing power. In comparison, that well over a hundred times faster than an thoroughly overclocked Intel i7-3960X -- a CPU that houses over 2 billion transistors. In the future, a true quantum computer may have the ability to solve unimaginably complex problems almost instantaneously. It sounds fantastic, but according to quantum mechanics, such a device could contain all possible solutions at any given time for any given problem. IBM imagined a scenario that would take billions of years to solve with today's processors and claims it may take about an hour on a quantum computer from the future. Mark Ketchen, an IBM physics of information group manager, admitted he used to think quantum-based processors were some 50 years away, but now he believes the wait time is more like 15. Big Blue's latest methods have taken the length of time information sticks around from an impractical one-billionth of a second to a far more usable one-10,000th of a second. That may sound like a tiny achievement, but Ketchen assures us this may take "practical" quantum computers from nearly impossible to achievable. Even though that is still not long enough for perfect calculations, it is almost good enough for error correction algorithms to detect and fix any mistakes. "We’re just crossing this threshold," Dr. Ketchen said, "which is a big morale booster that says, gee, this is becoming doable." Quantum mechanics is nothing new to microprocessors or the scientists and engineers who help design them. In fact, modern processors depend upon and work around such unintuitively bizarre quantum processes as electron tunneling, a phenomenon where particles can leak through solid barriers. Such observable phenomena is inexplicable under the scope of classical physics, but as processors become smaller and smaller, they venture further away from our everyday classical experiences and enter the strange realm of quantum mechanics. "These are very delicate systems," Steffen [Matthias Steffen is the manager of IBM's quantum computing group] said. "The one state is usually encoded in the excited state of a quantum system...that can decay like an atom can emit a photon. That's an error when it happens to our qubit. The frequency that errors occur limit your device's performance. If errors are few and far between, you can implement error correction." Despite the deep connection between quantum physics and existing modern processors, such devices do not actually leverage quantum processes to generate information -- they merely work around the limitations and quirks of this strange system. This is the difference between today's processors and the quantum variety which will actually utilize quantum quirks and behavior to compute information. Quantum dots, ion traps, quantum annealing, quantum entanglement are just a handful of natural processes being leveraged to create a real-life quantum computer. IBM's approach is being touted as possibly the most practical way to develop such a device, but only time will tell.